The current availability of environmental data has allowed speciation and biogeographical research with largescale ecological data like never before. Spatially explicit environmental data have increasingly been used in the framework of ecological niche models (ENMs) to assess niche divergence among species. Combining ENMs with phylogenetic studies allows a greater understanding of evolutionary processes such as speciation or niche divergence/conservatism. The comparison of ENMs between species to assess niche divergence requires a set of assumptions that must be evaluated. A set of new niche similarity metrics have been raised in the last years and new tools were developed. 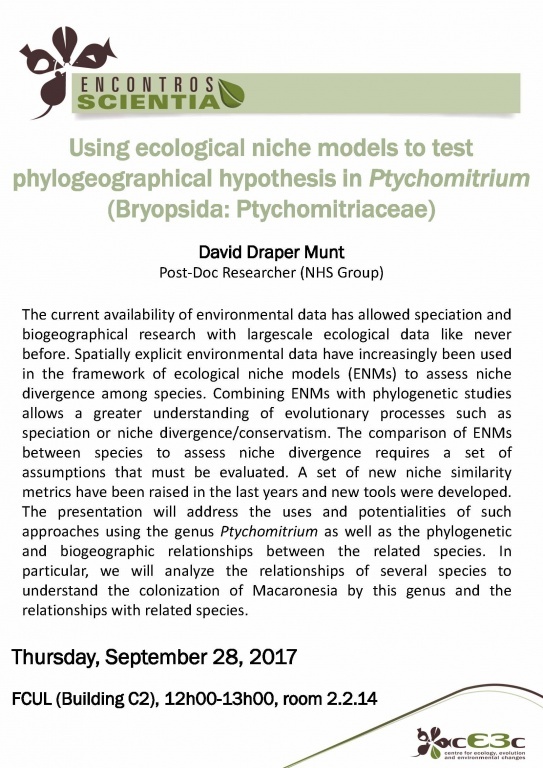 The presentation will address the uses and potentialities of such approaches using the genus Ptychomitrium as well as the phylogenetic and biogeographic relationships between the related species. In particular, we will analyze the relationships of several species to understand the colonization of Macaronesia by this genus and the relationships with related species.